1989 Sterling 827SLi - I know, I know... This is probably the third time I've written about a Sterling 827SLi. What can I say? I like them. I think the Europeans are right, a 5 door hatchback is much more practical, and in many cases better looking, than a 4 door with a trunk. The Sterling was a brilliant idea that was horribly executed. But, as I wrote in my earlier post, the later ones were better than the early ones and the 827SLi was the best of the bunch. Click here to see the eBay listing for this Sterling. 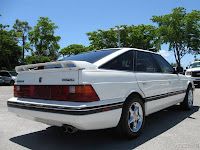 1991 Audi Coupe Quattro - The second generation of the Quattro Coupe has not yet reached the legendary status of the UR Quattro. Not quite as sporty as the UR Quattro Coupe, these second generation cars were not complete slugs either. The 20 valve I5 put out 164 HP and got the car to 60 MPH in just over 8 seconds. Of course what makes these cars special is Audi's Quattro AWD system which gives this car incredible handling abilities on all types of terrain. The car being offered on eBay has 180,000 miles on it and needs some relatively minor work. The asking price is slightly on the high side, but the body appears to be perfect and if you don't mind spending a weekend or two fixing the minor problems it has, it may be worth the price. Located in Farmington, CT, click here to see the eBay listing for this car. Click here to read the European Car review of the 1990 / 1991 Audi Coupe Quattro. 1974 TVR M - I featured a TVR 1987 280i in a post earlier this week. From the e-mails I received I know that some of you were not thrilled by its wedge shaped styling. 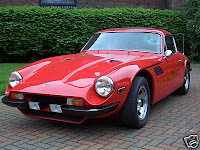 Here's a great alternative to the wedge, a TVR M Series car. Introduced in 1971, the M was was TVRs first "modern" car. The chassis and build quality were greatly improved over earlier models. The car being offered on eBay appears to be in almost perfect condition. Some worthwhile upgrades have been done to it and it was recently painted. 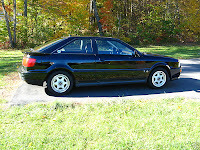 The seller is willing to deliver the car to Carlisle, PA, March 15. Carlisle presents some great car events throughout the year and May 15 - 17 happens to be the weekend of the Import / Kit / Replicar Event. Spending some time at Carlisle checking out the event and then driving home in a TVR sounds like a great way to spend a weekend. Click here to see the Carlisle website and schedule of events.